Sparkman Wharf just shared the complete line up of foodie havens planned for the dining garden. 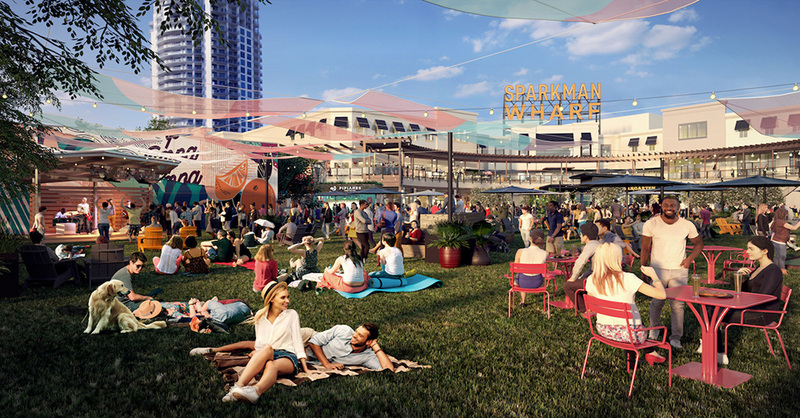 Opening in October 2018 alongside an open-air biergarten and event lawn, Sparkman Wharf’s dining garden will feature new food concepts from Tampa’s most well-known culinary professionals, offering fresh ideas and unique menu items not found anywhere else in the city. Boat Run Oyster Company, developed by SaltBlock Hospitality, is a sustainable tide-to-table concept featuring hand-raised, raw oysters from Cedar Key, Florida. BT in a Box, created by Chef BT Nguyen, is a fusion concept that puts a creative twist on classic French and Vietnamese dishes. Creating delicious foods that are nutritious and affordable, BT in a Box will offer a simple yet sophisticated dining experience with organic ingredients, small farm meats and poultry, wild fresh-caught seafood, and local Florida produce. The Corners Pizza brings Detroit-style pizza to Tampa’s waterfront. The new concept is the product of a collaboration between Chefs Noel Cruz and Anthony Messina, and Chef Messina will pair his Sicilian grandmother’s original dough recipe with some of the most simple and beautiful toppings. edison’s Swigamajig is a no frills channelside shanty that’s all about cocktails and the catch. Reinventing Florida’s quintessential seafood shack, edison’s swgamajig, created by Chef Jeannie Pierola, combines the allure of outdoor bohemian dining with a serious seafood menu, craft cocktails, beer and wine. Flock & Stock, focuses on high-quality American roadside favorites such as burgers, chicken sandwiches, tenders and fries. Embracing core values of community, fun, and hospitality Flock & Stock will treat all guests like family. Foundation Coffee, owned by Jason and Emily Smith, is dedicated to the art of craft coffee whose menu will feature items like breakfast sandwiches, locally baked pastries, and of course, cold brew, espresso, and more. Gallito Taqueria, the brainchild of Chef Ferrell Alvarez, is a modern taco shop that features fun twists on classic Mexican street food. Montados by Mise en Place will be a Spanish tapas concept paired with sangria by Master Chef apprentice, Chef Marty Blitz. Whatever Pops, crafted by Chief Chiller, Steve McGlocklin, serves house-made gelato, acai bowls, and ice pops. Everything at Whatever Pops will be made with real, wholesome ingredients. Each culinary concept, located within repurposed shipping containers that will be wrapped with visually engaging murals inspired by the Florida habitat and painted by local design firm Pep Rally, will celebrate great food and community. These new restaurants are located within the dining garden, along with an open lawn for recreation and relaxation and Fermented Reality – an open-air biergarten – to create a dynamic, park-like environment at Sparkman Wharf. Fermented Reality is planned to become a destination for waterside drafts with over 30 taps that emphasize Florida’s best craft beers.